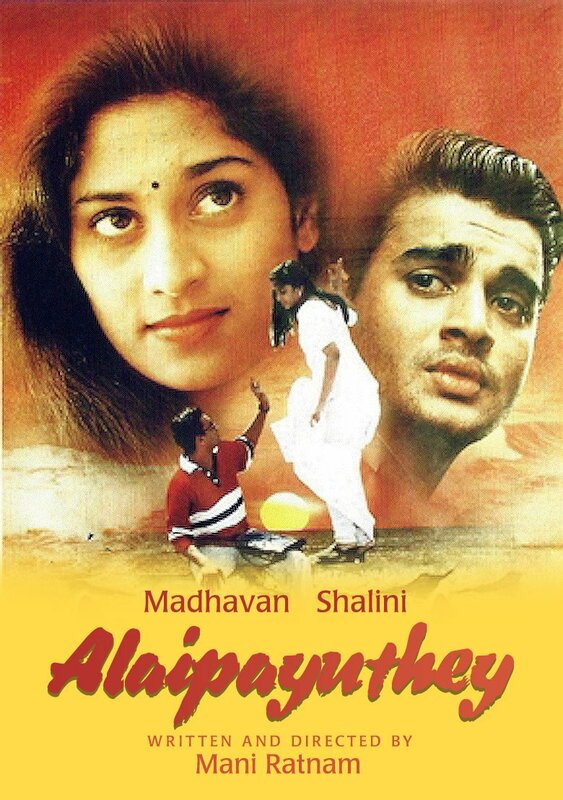 Alai Payuthey is a 2000 Indian Tamil romance film released on Apr 14, 2000. The film is directed by Mani Ratnam. Karthik (Madhavan) is an engineering graduate who happens to lay eyes on Shakti (Shalini), a medical student, at a wedding. The two meet regularly after their that on suburban trains, to and from work and university. Karthik and Shakti eventually fall in love. Karthik's father Varadarajan, a lawyer, learns of the relationship and meets with Shakti's dad Selvaraj. He asks Selvaraj, a railways employee, for his consent to a marriage between the two young lovers. However, upon meeting, the two parents disagree and the wedding is called off. Shakti decides not get married without her parents' consent, and the relationship is called off altogether. Unable to stay separated for very long, coupled with chance meetings, Karthik and Shakti find themselves resuming their relationship, albeit secretly, without the knowledge of their respective families. They decide to get married, without telling anyone, but carry on living with their parents, hoping that a time will come when both families will see eye to eye and can be told of the development. With the help of their friends, and Shakti's older sister Poorni (Swarnamalya), they marry legally, and they continue to meet without their parents' knowledge. Poorni gets a engagement proposal soon after. Poorni is willing to marry the suitor - Raghu. The prospective groom's father offers his second son's hand in marriage to Shakti. Shakti's mother Saroja urges her to accept the marriage proposal, unaware of the fact that Karthik and Shakti are already together. Shakti eventually tells the truth, and Poorni's engagement is called off. Karthik and Shakthi are thrown out of their homes. With the help of friends, Shakti and Karthik move into an apartment, in development. They cope for a while, however it's not too long before the couple start arguing over various issues that the two seemed so much more tolerant of before they got married. The tension escalates. Shakti learns that her father is seriously ill back home. She and Karthik decide it would be best to visit him. Upon arrival they get the news that her father has died. Wracked with guilt, the two return home, their relationship taking a turn for the worse. The two stop talking to each other. Meanwhile, Karthik takes it upon himself to sort out Poorni's adjourned marriage proposal to Raghu. He arranges a blind date between the two, which initially fails, backfiring on Karthik, however, with more meetings, Poorni and Raghu become closer. This development takes place without Shakti knowing. She and her husband have not spoken to each other for a long time. Karthik waits until Poorni and Raghu's marriage is confirmed before telling Shakti. Poorni is desperate to tell her sister the news herself. Whilst hugging Karthik, thanking him for his efforts, Shakti witnesses their close contact and misunderstands it, leading to an even bigger argument, and a trade of insults. Shakti eventually learns of her husband's efforts in getting her sister married, and wants to thank him. Karthik sets off to the railway station to get his wife. She had left the hospital where she works and neither is on the train she usually takes. Karthik waits for his wife. Check out this page for more updates on Alai Payuthey. This page provides latest and updated information about Alai Payuthey (2000) movie which released on Apr 14, 2000. Alai Payuthey (2000) is directed by , produced by , starring .We have also provided 0 trailers and videos, 1 photos, 0 user reviews, and 0 critic reviews.You can review, like, dislike this movie and also can add to favorites. You can also find information on showtimes, CDs, DVDs, online rental, online free watching.